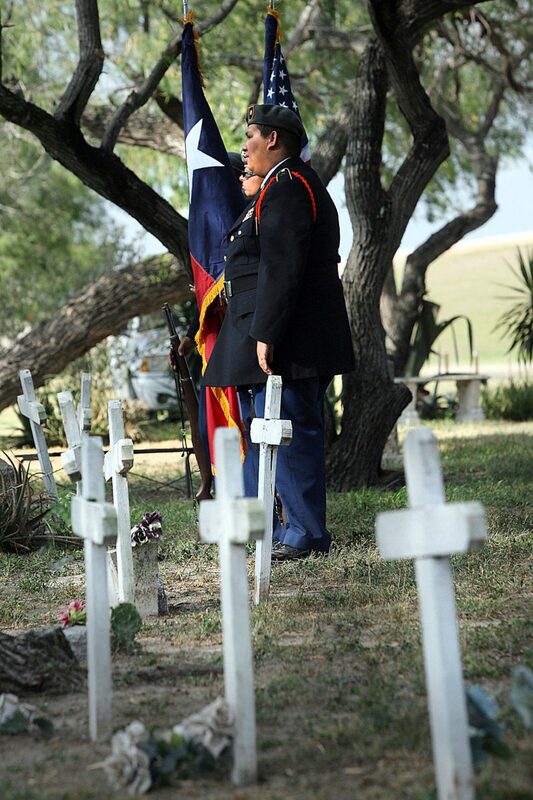 EDINBURG, Tx- Juneteeth Celebration at Edinburg's Restlawn Cemetery Saturday June 17,2017 in Edinburg. EDINBURG — For years, Lewis Callis, a retired mail carrier, pushed his lawnmower down the street for blocks toward a small, run-down cemetery, which is believed to be the Valley’s only black cemetery. One of the people who would see Callis pushing his lawnmower down the street was his neighbor, Valerie Ramirez of the Hidalgo County Historical Commission. 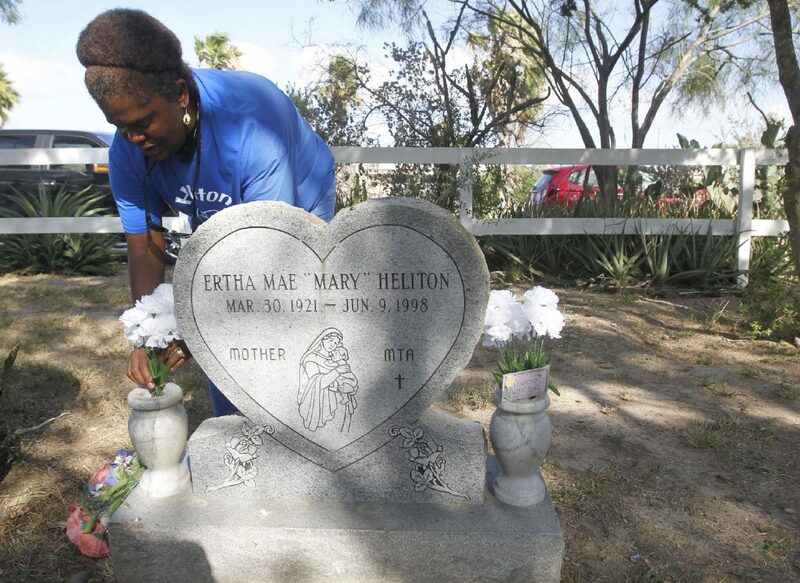 When she found out where he was headed, she pushed to begin commemorating Juneteenth at the cemetery, which the city did in 1993. Juneteenth, celebrated on June 19, commemorates the announcement of the abolition of slavery in the United States in 1865. Ollie Mae Heliton Gonzalez places flowers on the grave of her mother, Ertha Mae 'Mary" Heliton, at the Restlawn Cemetery on Saturday, June 17, 2017 in Edinburg. EDINBURG, Tx- Edinburg High Jr. ROTC present the colors during the memorial service at the African American Restlawn Cemetery Saturday June 17,2017 in Edinburg. When the day, also known as Freedom Day or Emancipation Day, was first commemorated at the cemetery, it was given the name Restlawn Cemetery by the Rising Star Missionary Baptist Church. Prior to that, it was referred to as the “Colored or Harlem Cemetery,” or the “Cabbage Patch.” A state historical marker was dedicated at Restlawn during the June 2008 ceremony. 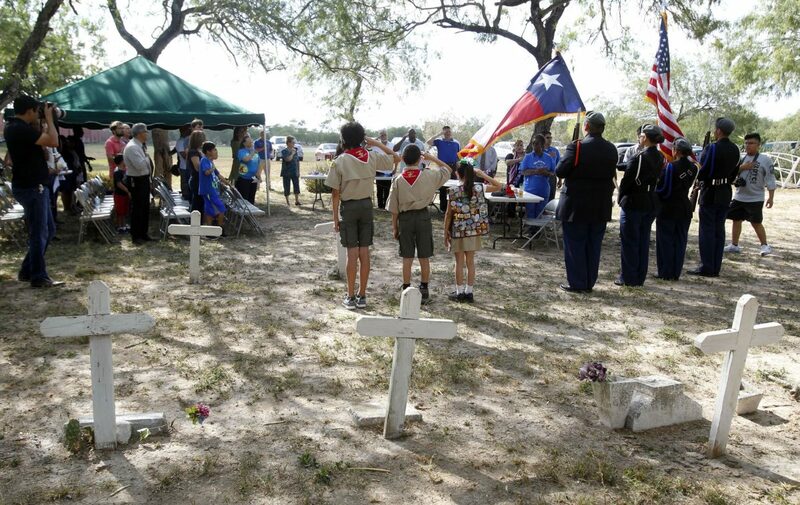 The city held its annual celebration on Saturday including a memorial service at the cemetery followed by a reception at the Dustin Michael Sekula Memorial Library. Speakers at the memorial service included Mayor Richard Garcia, Mayor Pro-Tem Richard Molina, Alex Moreno of the Hidalgo County Historical Commission, and Kim Callis, Lewis Callis’ daughter who led the crowd in song. Ollie Mae Heliton Gonzalez said she would bring her family to the cemetery to help maintain it. “I would bring my kids out here and my husband would bring the WeedEater and the lawnmower just to clear this area because it was really bad, you couldn’t see anything,” said Heliton Gonzalez, 57, who has four relatives buried at the cemetery. When she addressed the crowd, Heliton Gonzalez marked on the importance of spreading the word of the significance of Juneteenth and said she was overwhelmed by the people who had shown up for the event on Saturday.